By stayhomecupcake on March 18th, 2011 . 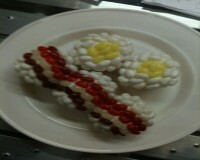 Filed under: Contests, Cupcake Ideas, Decorating . Do you like to decorate cupcakes? Well, maybe you should enter the Jelly Belly Cupcake Challenge! 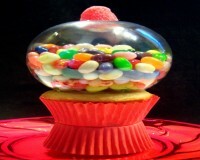 All you have to do is use Jelly Belly’s in your cupcake decoration and submit a photo to their website. The winner will receive $10,000! Click here for all the details. Thanks for posting this information! I will surely be entering. I will link back to your entry when I write all about my entry. Thanks! You’re not supposed to post your pics on third party sites. It’s against the rules. Since the gumball machine pic isn’t scewed like in the contest, I’d say it’s yours. Of course it’s your favorite Laurel. It’s also obvious that your bumping your own views and votes. They track your IP, so it’s obvious to JB too. Cheaters never win.